Dry needling is a technique used by physical therapists to decrease pain and improve function caused by musculoskeletal pain and dysfunction. However, not all PT clinics in the United States permit dry needling as a modality due to either the invasiveness of the procedure, the controversy of its efficacy, reimbursement issues and/or state licensure laws. Many studies have demonstrated dry needling has been efficacious for various musculoskeletal complaints, most evidently myofascial pain syndrome, which is characterized by trigger points. The purpose of this paper is to further summarize the anatomy and physiology of trigger points and dry needling, and in addition discuss its efficacy by briefly summarizing several recent articles. The invasiveness of dry needling has been a topic of discussion concerning patient and clinician safety. Dry needling is a clean technique as opposed to sterile. The physical therapist wears a glove on the hand that is in contact with the surface of the patient’s skin. Once the trigger point has been located, via palpation techniques, an alcohol swab is used to clean the site of interest. The size of the needle depends upon the anatomy of the target tissues. This microfilament needle resides inside a sterile tube. The needle is lightly tapped and thus inserted into the skin and is subsequently pushed into the trigger point with partial withdrawals. The pistoning technique is characterized by the insertion of the needle perpendicular to the trigger point with partial withdrawals. The winding technique is characterized by mechanotransduction of the tissue via twisting the needle. According to Dommerholt, a combination of the two techniques, pistoning and winding, is the most effective in reducing pain and eliminating the trigger point in both short term and long term (2011). The anatomy and physiology supporting dry needling is complex. The purpose of dry needling is to produce a large enough stimulus to disrupt the trigger point. Trigger points are palpable, hyperirritable nodules located within a taut band of skeletal muscle, often the sources of pain and agitation (Perreault, 2017). There are two different types of trigger points (TrP); latent and active. Latent trigger points will only elicit pain upon stimulation while active trigger points spontaneously cause pain, which may subsequently refer pain to other regions of the body (Dommerholt, 2011). Palpating an active TrP with sustained, deep, single finger pressure, the taut band will elicit an increase in pain and radiate to the zone of reference. This pattern of referral is known as a zone of reference which is both reproducible and consistent with patterns of other patients with similarly located TrPs (Venancio, 2009). Trigger points have various means of manifestation, including unusual concentric or eccentric loading causing stress on musculoskeletal tissues, poor posture, respiratory or visceral conditions, and generalized damaged tissue. Furthermore, the body may produce this taut band of contractured muscle with any type of abnormal activity (Dommerholt, 2011). Initially, TrPs are formed as a protective response to guard damaged tissue; for example, to help stabilize a hypermobile joint. However, trigger points may further progress to become maladaptive. The physiology behind the formation of a trigger point can be defined to the chemical level. The average motor synapse releases acetylcholine (ACh) from the pre-synaptic cleft into the synapse where it has the opportunity to bind to nicotinic-cholinergic receptors on the post-synaptic cell membrane. The latter begins with the occurrence of a stimulus to that particular cell, creating an action potential. There are cellular operations that remove the ACh from the synapse, halting the stimulus in order to regulate the cellular communication. These clearing methods include reuptake by the pre-synaptic cell and acetylchoineesterase, which clears out the synapse by breaking down ACh. These processes act as a regulatory mechanism for action potential propagation. The formation of a trigger point is linked to excessive release of acetylcholine into the synapse, a decrease in reuptake by the pre-synaptic cell, inhibition of acetycholineesterase, as well as an upregulation of nicotinic receptors on the post synaptic cell. The synapse has an increased amount of ACh, more receptors to bind to, and the recycling enzyme is absent. Therefore, this synapse has the ability to continually bind for longer periods of time, causing maladaptive characteristics as a result of the constant contracture of the musculoskeletal tissues. This dysfunctional synapse thus increases the nociceptive stimuli to the dorsal horn via afferent fibers (c-fibers and a-delta-fibers) causing an increased sensitization. C-fibers are unmyelinated afferent fibers that terminate in the dorsal horn, more specifically in; 1) lamina IIb, which organizes stimuli from mechanoreceptors and 2) lamina I, IIa, and V, which organizes nociceptive input. When C-fibers are consistently firing, they produce the “dull ache” and “tightness” many people experience. A-delta-fibers are small myelinated fibers that also terminate in the dorsal horn at lamina I, IIa, and V, the center for nociceptive organization. When these fibers are stimulated they produce a “sharp, stabbing” pain. The stimulation of these different neuronal fibers causes sensitization to these signals, which determines the classification of the TrPs. Contractured muscle isn’t necessarily painful until free nerve endings are constantly being stimulated resulting in the local physiological response of trigger points. Trigger points are highly sensitized structures within the local musculoskeletal tissues. However, with continuous nociceptive input from the trigger points to the dorsal horn of the spinal cord, peripheralization and centralization may occur. Peripheralization occurs when pain radiates distally from a trigger point. This is caused by an upregulation of existing receptors on the cell membrane by the release of histamine, bradykinin, acids, and serotonin. This subsequently stimulates the receptors, depolarizing the cell at a lower threshold, sending nociceptive action potentials more frequently and causing primary hyperalgeisa. Centralized pain occurs with C-fiber bombardment of nociceptive stimuli resulting in an increase of N-methyl-D-aspartate (NMDA) receptors in the dorsal horn which process glutamate (neurotransmitter participating in pain transmission) from C-fiber stimuli. Increased C-fiber nociception is processed at the dorsal horn and with persistence, neuroplastic changes will occur. The anatomical organization of dorsal horn undergoes disorganized changes in order to process the overload of nociceptive pain signals. Furthermore, substance P (neurotransmitter included in pain processing) is released from primary afferent fibers alongside glutamate. Substance P travels to the periphery to lower the threshold of C-fibers creating an environment allowing stimuli to more easily create nociceptive action potentials. Trigger points have local ischemia and hypoxia, which induce the spontaneous ACh release, resulting in a significant drop in pH inside the trigger point. This maladaptive environment contributes to the self-sustaining cycle of myofascial pain including allodynia and hyperalgesia. Thus the trigger point now has a lower threshold and, therefore, a lower magnitude stimulus, as simple light touch or muscle movement will result in the release of glutamate and substance P to the spinal cord to be processed as nociceptive stimuli. Patients with myofascial pain often demonstrate abnormal breathing patterns resulting in respiratory alkalosis, which is an increased pH due to decreased CO2, contributing to an optimal environment for continuing this maladaptive cycle. Prolonged nociceptive input at the dorsal horn will cause glutamate to activate the upregulation of α-amino-3-hydroxy-5-methyl-4-isoxazolepropionic acid (AMPA) receptors causing the release of substance P, which resultantly induces NMDA receptors to glutamate. This causes an influx of calcium, which increases the sensitivity of AMPA to noxious stimuli, ultimately leading to referred pain and a decrease in voluntary muscle use due to this pain (Dommerholt, 2011). The goal of dry needling is to interrupt this cycle so the neuromuscular system has an opportunity to reverse this process and regulate the physiological response to noxious pain. Dry needling interrupts the self-sustaining cycle of trigger points via initiating a local twitch response. A local twitch response is a visible contraction of musculoskeletal tissues caused by stimulation of the trigger point nociceptors. This mechanical disruption of muscle and nerve fibers provides increased afferent stimulus to the dorsal horn, disrupting the cycle, and working to regulate a normal physiologic response to noxious stimuli. Decreased levels of substance P were found in trigger points after a local twitch response was elicited. This decreases spontaneous release of ACh at the synapse, causing decreased levels of substance P, and increased endorphin release (Dommerholt, 2011). Eliminating trigger points reduces the pain and tenderness locally and interrupts the cycle at the spinal cord. There are two types of techniques of dry needling: pistoning and winding. Pistoning involves a rapid insertion with partial withdrawals into a trigger point. Winding involves the insertion of the needle and twisting it in a “screw-like” fashion initiating the activation of receptors on peripheral nerve endings via mechanical disruption. These nerve endings are activated by low pH, increased temperature, and mechanical stimulation. This results in a calcium influx leading to tissue remodeling and blockage of pain. It increases the intracellular ATP and adenosine, which activates the A1 adenosine receptors to inhibit adenylate cyclase, blocking nociceptive input. It has been shown that a combination of the two techniques result in the greatest long and short-term effects (Dommerholt, 2011). As physical therapy is an evidence based practice, research is vital to the progression of the profession. There are many studies experimenting with the efficacy of dry-needling on myofascial pain, and more specifically targeting reduction of trigger points. There is research comparing dry-needling versus wet needling and other treatment to help demonstrate the efficacy of dry-needling as a modality of choice. Mayoral et al. researched the efficacy of dry needling on myofascial trigger points before a total knee arthroscopy (TKA) in order to compare pain levels post-surgery. This randomized, double-blinded, placebo-controlled study discovered that pain after a TKA is usually the highest one-month post-surgery. Furthermore, Mayoral et al. compared dry-needling to sham needling in terms of decreasing trigger points in order to decrease pain. Consequently, it was found that dry-needling is an efficacious treatment for reducing pain one-month post-total knee arthroscopy (TKA). These researchers also noted the local twitch response elicited with dry needling is a spinal reflex, as a local twitch response was still produced while the patient was under anesthesia. Therefore, the local responses to dry-needling are important to interrupt the self-sustaining cycle (2012). A study was done by Tuzun, Gildir, Angin, Tecer, and Dana comparing a classic treatment program to a program that included dry needling in patients with chronic low back pain. The classic treatment program included a home exercise program, hot packs, and TENs unit applied to the patients back. At the end of the study, it was concluded that dry needling had a greater effect on decreasing pain, decreasing the number of TrPs, and desensitizing the patients lower back, assessed by the patient’s fear of movement (2017). Brennan, Allen, and Maldonado investigated the usage of dry-needling compared to cortisone injection as an alternative treatment for greater trochanteric pain syndrome (GTPS). Greater trochanteric pain syndrome is an umbrella for many disorders including bursitis, tears of the gluteal musculature, external coxa saltans, and trigger points. Traditionally, a cortisone injection has been the treatment of choice for greater trochanteric pain syndrome. However, as previously stated, there are many variants of greater trochanteric pain syndrome and cortisone may not be applicable to all disorders. Furthermore, Brenna, Allen, and Maldonado compared two treatment methods; cortisone injection versus dry-needling in patients with greater trochanteric pain syndrome. In conclusion, these researchers discovered that dry-needling is just as efficacious as cortisone shots. Not only is dry-needling non-inferior but also provides less risk of side effects (2017). Ga, Choi, Park, and compared the difference in dry-needling and lidocaine injection of trigger points. The patients were randomized, and treated three times throughout the study. They were treated at the start of the study, at one week out, and again at two weeks out, treating all palpable TrPs. 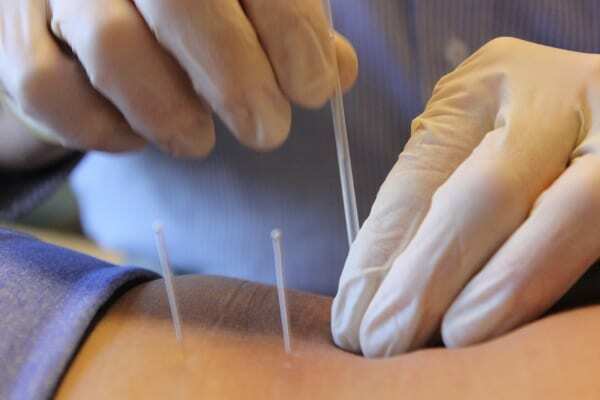 They concluded that there was not a significant difference between the lidocaine injection with dry-needling compared to dry-needling alone (2007). Hayta and Umdu did a study comparing dry needling to kineseo-taping. They performed the treatments on patients with cervical myofascial pain syndrome with upper trapezius TrPs. The patients were scored based on their scores on a Visual Analog Scale, neck disability index, and Nottingham health profile. After the 12-week trial, both modalities were noted to be effective in reducing pain, with dry needling having a greater long-term effect. However with dry needling, immediate soreness and decreased range of motion was noted, but was regained within hours of completing treatment (2016). Kheradmandi, Ebrahimian, Ghaffarinejad, Ehyaii, and Farazdaghi investigated the effectiveness of treating trigger points that produce referred pain in the shoulder distally to the elbow to discover the effects on pain. They used dry-needling on the trigger points located in the shoulder and neck. The referral pattern of the subscapularis, infraspinatus, and supraspinatus is distalto the lateral elbow. This study demonstrated decreased pain in the lateral elbow with the elimination of trigger points at the shoulder and neck with subsequently improved grip strength (2016). Fernandez-Carnero, Touche, Ortega, and Del-Rio designed a study to test the effects of dry needling in patients with temporomandibular disorders. Their study compared the effects of dry needling to sham needling to see if they could increase pain-free jaw opening, decrease the pressure-pain threshold, and minimize the amount of pressure that first causes a sense of pain. The patients were treated twice, with each session seven days apart. The conclusion was that dry needling increased the patients’ pressure-pain threshold as well as increased their pain-free jaw range of motion (2010). With continued ongoing research, dry needling is proving to be a growing modality of choice by physical therapists to decrease pain and improve function especially when active trigger points are noted. Physical therapists should be wary of using this modality as “the silver bullet-a one size fits all treatment” for all musculoskeletal pain and dysfunction. Decreasing the pain of a trigger point is a priority, but not the end goal. As physical therapists, it is also our duty to our patients to also attempt to discover and address the cause of their painful dysfunction with all the tools available to us as physical therapists, including education and rehabilitation. Brennan, K. L., Allen, B. C., Maldonado, Y. M. (2017). Dry needling versus cortisone injection in the treatment of greater trochanteric pain syndrome: A noninferiority randomized clinical trial. Journal of Orthopedic and Sports Physical Therapy; 47: 232-239. Dommernolt, J. (2011). Dry needling: Peripheral and central considerations. Journal of Manual and Manipulative Therapy; 19, 223-237. Fernandez-Carnero, J., La Touche, R., Ortega-Santiago, R., Galan-del-Rio, F., Pesquera, J., Ge, H., & Fernandez-de-las-Penas, C. (2010). Short-Term effects of Dry Needling of Active Myofascial Trigger Points in the Masseter Muscle in Patients with Temporomandibular Disorders. Journal of Orofacial Pain,24(1), 106-112. Ga, H., Choi, J., Park, C., & Yoon, H. (2007). Acupuncture needling versus lidocaine injection of trigger points in myofascial pain syndrome in elderly patients. Acupuncture in Medicine,4, 130-136. Hayta, E., & Umdu, N. (2016). A Randomized Trial to Study the Comparison of Trigger Point Dry Needling Versus Kinesiotaping Technique in Myofascial Pain Syndrome During a 3-Month Follow-up. International Journal of Physiotherapy,3, 540-546. Kheradmandi, A., Ebrahimian, M., Ghaffarinejad, F., Ehyaii, V., & Farazdaghi, M. R. (2015). The Effect of Dry Needling of the Trigger Points of Shoulder Muscles on Pain and Grip Strength in Patients with Lateral Epicondylitis: A Pilot Study. Journal of Rehabilitation Sciences and Rearch,3, 58-62. Mayoral, O., Salvat, I., Martin, M. T., Martin, S., Santiago, J., Cotarelo, J., & Rodriguez, C. (2013). Efficacy of Myofascial Trigger Point Dry Needling in the Prevention of Pain after Total Knee Arthroplasty: A Randomized, Double-blinded, Placebo-Controlled Trial. Evidence-Based Complementary and Alternative Medicine,1-8. Perreault, T., Dunning, J., Butts, R. (2017). The local twitch response during trigger point dry needling: Is it necessary for successful outcomes? Journal of Bodywork and Movement Therapies; 21: 940-947.
chronic low-back pain: a single-blind, randomized, controlled trial. Journal of Physical Science; 29: 1502-1509. Venancio, R. D., Pereira Alencar, F. G., Jr., & Zamperini, C. (2009). Botulinum Toxin, Lidocaine, and Dry-Needling Injections in Patients with Myofascial Pain and Headaches. Journal of Craniomandibular Practice,27, 46-53.